What is the structure of manual chuck. Do you sell back plates for scroll chucks? We do not sell back plates for scroll chucks. * Please contact your local dealer to purchase back plates for scroll chucks. Can short taper type chucks be installed on any manufacturer’s machine if the taper size matches? In case of short taper type chuck installation some manufacturers’ machines require taper adjustment. Kitagawa keeps "No. 0 taper" as the standard stock. The No. 0 taper matches the following manufacturer's lathe. 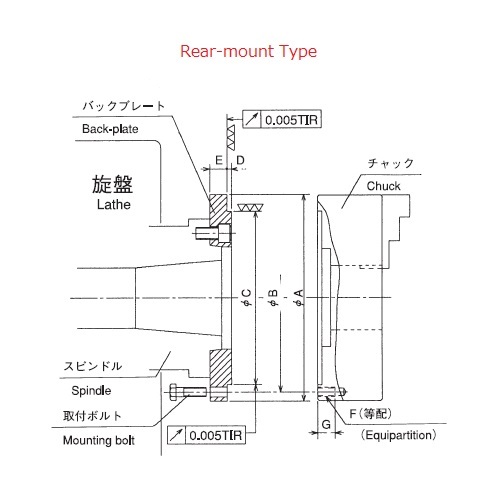 For the machines other than the following manufactures’ need taper adjustment. The taper adjustment fee will be charged separately. Is it possible to purchase a scroll chuck with internal jaws, external jaws and hard jaws? Yes, we can supply them. However, the gripping accuracy may be affected. Also, when internal jaws, external jaws or hard jaws are replaced, there is a possibility that repeatability may deteriorate. Especially when you replace hard jaws, gripping accuracy will not be retained as the original hard jaws supplied with the chuck are set and ground together in the manufacturing process. Please tell me the gripping accuracy of the scroll chuck. We provide scroll chucks with gripping accuracy within 30μm after assembling. Even if only one part is replaced, the chuck may not return to the original gripping accuracy. What are the shapes of lathe spindle ends? There are two types, A1 nose and A2 nose. Please see here for the difference.